This Table is ideal to mount the whole range of ophthalmic diagnostic equipment ( yag laser, auto-refractometer, slitlamp etc) with smooth, noise free, motorized, feather touch operated up-down movement. Our wheelchair accessible tables give a feeling of delight and comfort to the users. We are widely well renowned as one of the superior wheelchair tables exporters from India. Thoughtful technology for special needs. This motorized Instrumentation Table has a special, Scientifically asymmetric design. It precisely balances the table from a side leg and distribute the weight scientifically across the table structure. It enables comfortable testing sessions and interactions between the doctor and wheel-chair-using patient and regular patient. 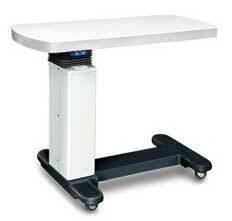 This Table is ideal to mount the whole range of ophthalmic diagnostic equipment. ( Yag Laser, Auto-Refractometer, SlitLamp, etc) with smooth, noise free, motorized, feather touch operated up-down movement, This table is a userâ��s delight.